(noun) A crafty scheme or cunning design for the accomplishment of a sinister end. Usage: During his early youth he had to contend against the machinations of a malignant uncle, who would have robbed him of his large possessions. Definition:	(noun) A crafty scheme or cunning design for the accomplishment of a sinister end. Usage:	During his early youth he had to contend against the machinations of a malignant uncle, who would have robbed him of his large possessions. 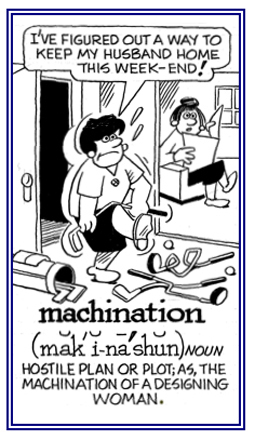 NOUN - (machinations) a plot or scheme. History is still ultimately a question of class struggle, and the developments of the nineteenth century are dominated by the machinations of bourgeois capital.